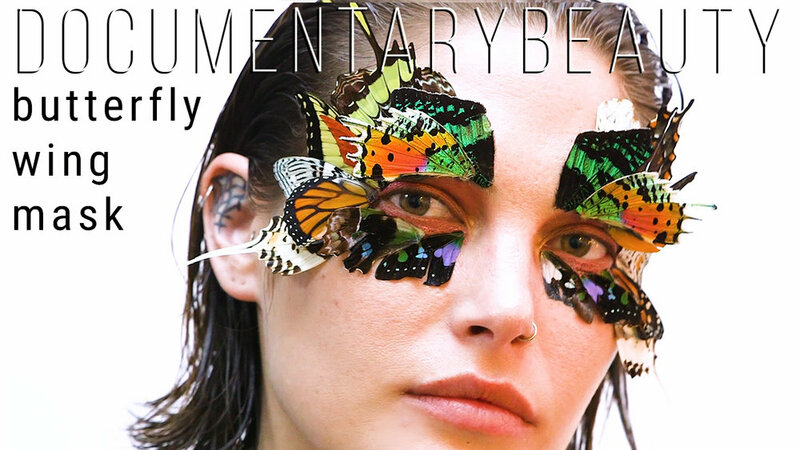 The Butterfly Wing mask I created on Cat McNeil for the Documentary Beauty 003 Spirit Animal Story was the moment of metamorphosis when Cat becomes connected with the soul of the butterfly. It was my favorite look because of the challenging nature of the butterfly wings, and the three deminsional shape and archetecture of the mask. I was excited and nervous to see my design come to life! I could see in my mind exactly how I wanted the shapes and the colors to come together but executing it on the shoot with limited time was the real challenge. I tried not to overthink it. I prepped for the shoot by sorting out a few application logistics as there wasn't a lot of time to move the wing in place before the adhesive would dry and possibly tear the delicate wings. Thankfully my husband was a good sport and let me practice on him leading up to the shoot. After working with them a bit I knew the final design would just happen organically, the day of. I sourced these beautiful, preserved butterfly specimens from a reputable company that works very hard to keep butterfly populations healthy in endangered areas. The idea that we could create art out of the specimens I thought was a really beautiful way to celebrate the life and grace of the butterflies. First I layed out the wings to map out my placement, I wanted the wings to look layered and three dimensional. As I was playing with the shapes and placement, I was blown away by how similar their shapes were to winged liner and her own lashes and lash line. The mask evolved naturally with the lines of her eyes, I built the shape based on the colors and symmetry of the wings, I placed the smaller wings underneath the eyes to mimic her bottom lashes. The organic shapes and colors really came together beautifully and naturally. I was so happy I didn't overthink it and trusted my process. After the Mask was in place I freshened up Cat’s skin using the Koh Gen Do Moisture Foundation #112, applied with the MAC #190 Foundation Brush. For cheeks I used the MAC Taupe Blush, applied with the Chanel Powder/Contour Brush, followed by the Madina Chic and Shine Stick on top of the cheekbones. For the eyes I applied shadow all over the lid to accentuate Cats’ green eyes. I wanted her lid color to be more natural and blushy, I used MAC Cranberry Eyeshadow, using the MAC #266 blending brush focusing the color right on the lash line. The custom designed Butterfly Mask was applied with Duo Lash Adhesive in Clear using the Shu Uemura lash application wand. To finish the look I used Smith's Rosebud Salve, using the MAC synthetic brush #242. For Hair Kayla MiChele finger combed Oribe Gold Lust Nourishing Hair Oil throughout the hair to create a loose wet look.